The Garnet is a stone of vitality and passion. Color: The versatile garnet comes in a virtual rainbow of colors, including pink, red, purple, orange, yellow, violet, green, colorless, occasionally black, brown and many shades of red and green. The most common color of garnets is reddish brown. Bohemian Garnet is deep red gemstone, Russian Demantoid and African Tsavorite are vibrant green. Description: Pyrope: Mg3Al2[SiO4]3. Garnets are a group of common silicate minerals that have similar crystal structures and chemical compositions. It can be translucent to transparent, sometimes opaque with a vitreous or resinous lustre. The best known type of garnet is red semi-precious stone pyrope, one of several red gems, which the ancients used to call Carbuncles. Garnets are actually one of the largest families of gemstones. Most natural garnets are mixtures of two or more of the following pure species: pyrope, almandine, spessartine, uvarovite, grossular, andradite. Garnets occur in a very wide variety of formations, colors, and clarities. The name's origin: Garnets were so called by the ancient Greeks since color reminded them of the pomegranate seed or granatum. Birthstone: The garnet is considered to be the birthstone for Capricornus (Goat): Dec. 22 - Jan. 19. Varieties: There are following major types of garnets: Almandine, Pyrope (also called Bohemian garnet, or Cape ruby), Spessartine, Grossular (also called grossularite, or Gooseberry garnet), Andradite, Rhodolite, Carbuncle, Hessonite (also called essonite, or Cinnamon stone), Topazolite, Uvarovite and Uralian emerald (or demantoid). 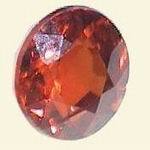 Care and treatment: Clean garnet with a dry soft cloth. As with all gemstones, care should be taken to protect it from scratches, sharp blows, harsh chemicals and extreme temperatures. From the stone history: One of the world's most ancient gems, garnet has been treasured for thousands of years. Use of garnets as gems is traced to the Nile Delta in 3100 B.C. Egytian artisans created beautifull garnet beads, bracelets and other jewelry. Garnets since ancient times used widely as an abrasive. Garnets are said to have been used by Asiatic tribes in place of bullets. During the latter part of the 19th century, garnet bracelets and brooches were particularly popular. Most familiar during the peak of popularity were varieties of pyrope. The hardness of garnets and their sharp fracture make them suitable as abrasives for wood, leather, glass, metals, and plastics. Garnet varieties have become known by misleading names, frequently consisting of a locality with the name of another mineral variety, such as Uralian emerald or Cape ruby. Shopping guide: Garnet is a reasonably priced stone. It is beautiful in rings, pendants, necklaces and bracelets. There are some beautiful orange garnets. A green tsavorite garnet is a very rare and high-priced stone. The dazzling beauty of garnets is responsible for their widespread use as gemstones. Deposits: Garnets are found in a wide variety of locations including Kenya, Sri Lanka, Thailand, Brazil, India, Madagascar, Canada and USA. In USA garnet has been obtained in Arizona, Colorado, Georgia, Idaho, New Hampshire, New Mexico, North Carolina, Pennsylvania, Utah, Florida, California and Virginia. The majority of today's Garnet supplies come from Africa. Notable quantities of garnets have been also found in Czech Republic and Spain. The oranges and browns of Spessartite and Hessonite hail from Namibia and Sri Lanka.